Canon has introduced two new optics fitted with stepper motor technology for use when recording video. First up, the EF 40mm f/2.8 STM pancake lens promises smooth and quick focusing when shooting movies. With the ability to focus from as close as 0.3 metres, the autofocusing is slightly slower than USM focusing. Canon says that the lens is ideally suited to shooting stills of most subjects, with the possible exception of sport. Secondly, an EF-S 18-135mm f/3.5 - f/5.6 STM lens has been announced, as a replacement for the previous model. The EF-S 18-135mm f/3.5 - f/5.6 IS STM features Dynamic Image Stabliser and has a minimum focusing distance of around 0.39 metres. As it is an EF-S model, it is only compatible with APS-C format cameras (Canon EOS 7D and downwards). 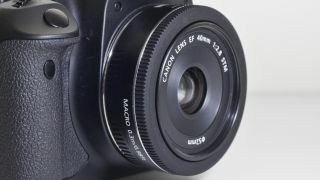 The 40mm lens is compatible with all Canon EOS DSLRs. The Canon EF 40mm f/2.8 STM price will be £229.99 (about $355), and is likely to be available from the end of June. The Canon EF-S 18-135mm f/3.5-5.6 IS STM price will be £479.99 (about $740) and will be available from July.